Incredible savings by going mobile for all events. 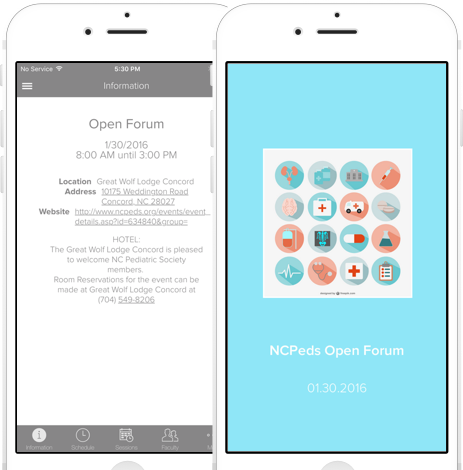 North Carolina Pediatrics Society chose Yapp over paper and other event apps for their event guidebooks for 4 events a year. This saved them 60% in print costs, 120 hours in manual labor and up to $7,500 compared to other solutions. North Carolina Pediatrics (NCPeds) exist to advance and distinguish the role of pediatric medicine as a healthcare destination and support the ongoing success of our membership through education, advocacy, community awareness, benchmarking and promoting standards of excellence. John and two other colleagues were spending at least one entire week prior to each event to build the paper guidebooks that were 20 to 40 pages long. That’s up to 120 hours spent in compiling the agendas and 20,000 pages of paper for an event with 500 people. While paper is a renewable resource, the amount of money and time wasted on printing was too great to ignore. John wanted to take the guidebooks mobile so attendees could easily access all the information they need at an event. Every year at their events they see an increase in use of Yapp and decrease in request for hard copy meeting materials. They’re now down to printing minimal copies of only the schedule page. Their annual printed material development and product costs used to exceed more than $12,000. Now with Yapp, the total cost is less than $5,000. After deciding to make the switch from paper to mobile apps, reviewing several options for event app providers, John and his team at NCPeds found Yapp. When they compared the feature list and price, they determined Yapp was the best option on the market. Want affordable event apps for your association? The best solution for small staff associations! Create a mobile app for association meetings and events in a matter of minutes.